M. Dias Branco has modern production facilities strategically located in its principal markets, consisting of fifteen industrial plants with the latest technology that the Company operates in line with rigid quality standards. Margarine and Shortening factory (Fortaleza-CE). From 2012 to 2014, the Company launched 114 new products in the market that reached R$ 118.2 million reais of gross revenue. In 2012 there were launched new flavors of instant pasta with brands Adria (Liggero and GRANO D’ORO), Fortaleza (Express pre-cooked lasagna) and Vitarella (filet steak and bacon flavors Lámen). In the cookies segment it was launched Richester Amori Mini Filled Cookies (flavors vanilla and chocolate), butter cookies with Pilar brand (flavors chocolate, coconut, milk and orange) and waffle (flavor chocolate candy), among others. In 2013 were launched new flavours of microwave pasta with Adria brand (Liggero), (ii) Gold Class line biscuits, (iii) mega filling waffle and tartlets with Vitarella brand, and (iv) Animados Zoo Richester biscuits. In 2014 it was launched: (i) new cuts of pasta with Basilar brand (Baveti, Gnocchi, Tortilhone and scratched double Penne) and instant noodles “cheese flavor” with Vitarella brand, (ii) Escureto double filling cookies with Richester brand, mini cocktail snacks “cheese” flavour with Fortaleza brand, wafer “neapolitan” flavour with Vitarella brand, (iii) margarines with Vitarella brand, and (iv) cake mixes with FINNA brand, among other launches. In 2014 we invested R$ 3.1 million in research, development and product innovation. We concluded 26 optimization projects, targeting new cookie shapes, sensory improvement, packaging adequacy, adaptation of formulations, sodium reduction, among others, positively impacting hundreds of our products. These improvements focus on the efficiency of industrial processes, service regulation, to improve the quality and especially the greater satisfaction of our consumers. 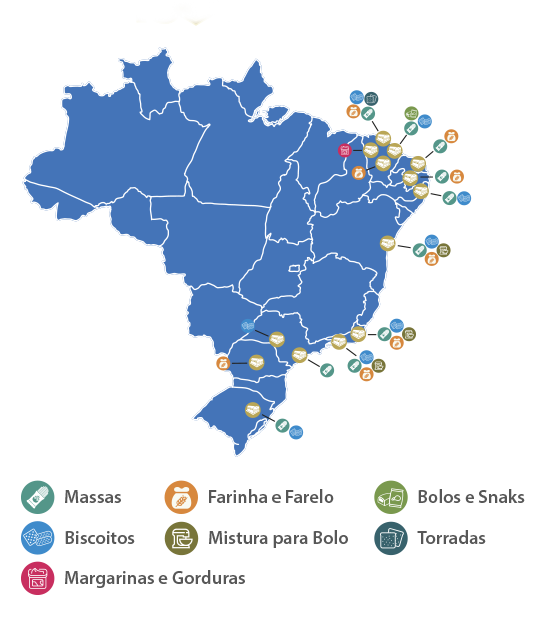 In 2015, R$ 6.5 million was invested in research and development (R$ 5.2 million in 2014) across 49 projects, including new products, improvements, and optimization. A number of projects were also conducted to optimize resource utilization without affecting product quality or sensory properties. Were invested in research and development in the year 2016, the amount of R $8,100,000. The value represents our net revenues 0.15%. For 2017, the company will work with a portfolio of 160 projects, with a focus on Healthiness, sustainability and Indulgence, following new Innovation methodology established.